Who’s afraid of the Big Bad Wolf, as the old children's tale goes? Slot enthusiasts certainly shouldn’t be, given that the titular furry fiend, the Wolf himself, is serving up a jackpot prize of 1,000 coins in his popular title from Quickspin, a budding online slot developer dedicated to producing top UK slots for the web. Offering a Free Spins round complete with multipliers and scatters, plus the appropriately-named ‘Blowing Down the House’ feature (read on for more on this fun and exciting feature) delivering spins and boosted payouts, this is one wolf you won’t mind running into, day or night! 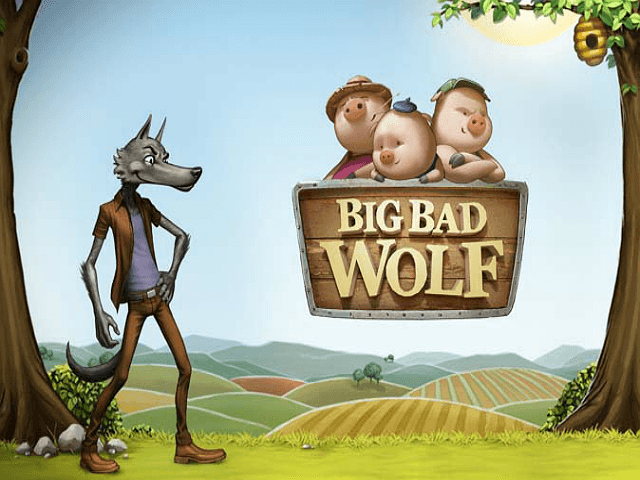 The classic fairytale involving the shoddy workmanship of the Three Little Pigs and the hungry wolf seeking his next pork belly dinner has been given the slots treatment by Quickspin. This is not the first time that the brand has delved into classic storytelling, either: both Goldilocks and the Three Bears and The Three Musketeers have already been brought to life in slot-tastic form. The action unfolds in the porky pals’ straw house (what were they thinking when they decided to build that? ), with the classic five-reel and three-row formation. Every single winning combination in Big Bad Wolf, no matter how big or small, is subject to the Swooping Reels feature. Here all winning symbols disappear from your reels and are replaced by new ones falling from above. Any new winning combos are added to your payout, and this process continues until no new wins are revealed. The scatter symbol is the eponymous Big Bad Wolf, and three or more of these on your reel triggers the Free Spins round. Ten freebies in all are yours and these come backed with a tasty 3x multiplier. They can be re-triggered, too. 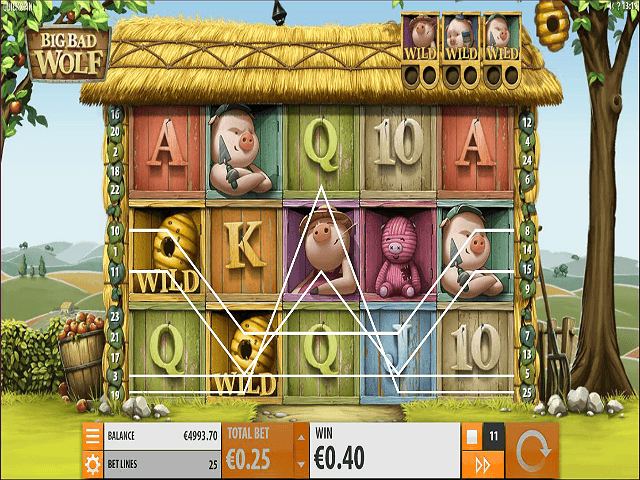 This slot game also offers players a unique take on the wild symbol as well. It has the traditional wild, the Honeypot, which substitutes for all non-special symbols as well as dishing out prizes up to 1,000 coins for matching five on your reels. But there’s a twist… Each of the three pig symbols can also turn wild after a succession of winning spins. Every second winner will turn a pig wild, so two spins sees the purple porker go wild, four brings the blue pig out of his shell and finally six wins turns the green pig loose. The undoubted star of the show in Big Bad Wolf is the ‘Blowing Down the House’ feature. 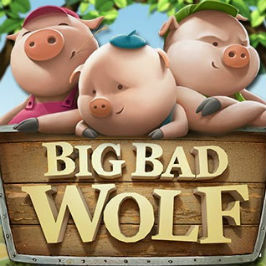 During the Free Spins round the wolf will try to blow down the little piggies’ houses... and players can help. All you need to do is collect the moon symbols which appear during the feature. 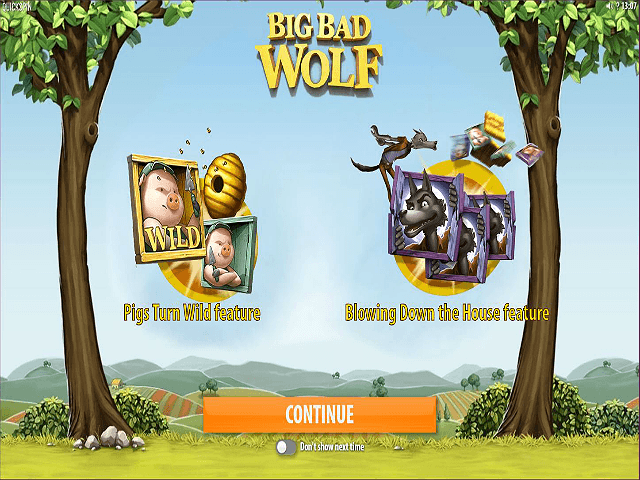 Three moons blows down the wooden house and earns players two more free spins, while six moons enables the wolf to blow down the brick house (some effort) and awards players with two free spins and a 2x multiplier on all subsequent freebies. 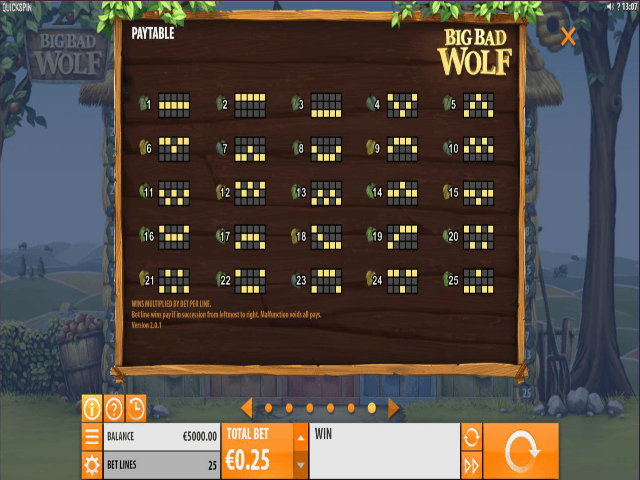 If you like Big Bad Wolf - You'll like these slots too!